Hackman's father abandoned the family when he was 12, and his mother was an alcoholic, leaving their son to be raised mostly by his maternal grandmother. He was briefly jailed as a juvenile for shoplifting, then dropped out of school, ran away at 16 and, lying about his age, joined the Marines. After his tour of duty, he used the GI Bill to study journalism and TV production, and worked as a radio announcer, shoe salesman, and truck driver until, reassessing his life as his 30th birthday approached, he decided to try becoming an actor. He enrolled for acting classes, became fast friends and eventually roomed with classmate Dustin Hoffman, and soon found a few stage and television roles. In his first, brief screen appearance, he played a policeman in 1961's Mad Dog Coll with Jerry Orbach. He made his Broadway debut opposite Peggy Cass in Children From Their Games, which closed two days after it opened, but by the mid-1960s he was working steadily in a succession of Broadway plays. His first substantial film role was in the drama of mental illness Lilith with Jean Seberg and Warren Beatty, and his first critical acclaim came with his Oscar-nominated role as Beatty's brother in Bonnie and Clyde. Among his other famous roles, he played the bug-master in The Conversation with John Cazale, the ordinary hero of the cheesy Poseidon Adventure with Shelley Winters, a campy Lex Luthor in Superman with Christopher Reeve, the perfect high school basketball coach in Hoosiers with Barbara Hershey, the sly Secretary of Defense in No Way Out with Kevin Costner, an untalented filmmaker in Get Shorty with John Travolta, a rogue spy in Enemy of the State with Will Smith, and the patriarch of a wildly dysfunctional family in The Royal Tenenbaums with Owen Wilson. Now semi-retired, Hackman's last film was the rather embarrassing Welcome to Mooseport with Ray Romano. Working with archeologist Daniel Lenihan, Hackman has co-written a few novels. 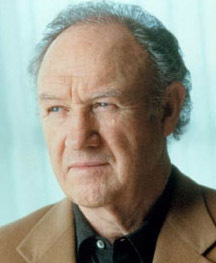 In 2001, Hackman was involved in a very minor fender-bender in Los Angeles. Witnesses said that when the two drivers emerged from their cars to exchange information, the driver of the other vehicle was belligerent, and became more and more angry over several minutes, finally shoving the 71-year-old Hackman. According to the police report, Hackman responded by pummeling the other driver with a half-dozen blows before the two men were restrained. No charges were filed. His mother burned to death in 1962 when, drunk and smoking in bed, she fell asleep and her cigarette ignited the mattress.